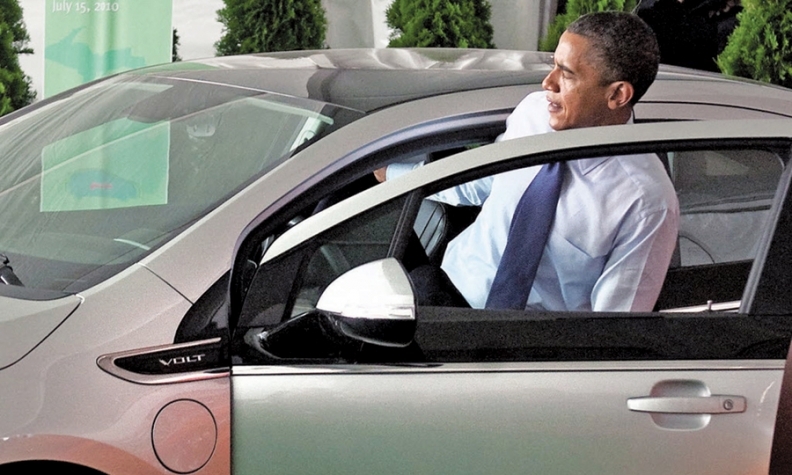 President Barack Obama tried out a Chevrolet Volt in 2010 during groundbreaking ceremonies for a battery plant in Michigan that would supply Chevrolet and other EV makers. While the White House pushes plug-ins, consumers aren't buying in big numbers. WASHINGTON -- A disconnect is emerging between the White House and the auto industry over the short-term future of electric vehicles and plug-in hybrids. President Obama is pushing ahead with his goal of getting 1 million plug-in vehicles on U.S. roads by 2015. He's even redoubling his efforts for federal support. But automakers, while acknowledging EVs and plug-in hybrids as important to enabling them to meet long-term fuel-economy mandates, are emphasizing more traditional fuel-saving technologies in the short term. "Everybody rushed toward EV vehicles and hybrid vehicles," said Mark James, director of Lotus Engineering, a consulting company that specializes in advanced vehicle technologies and fuel efficiency. "Now, they're going back, and saying, 'Actually, we need to look at engines,'" especially ultra-fuel-efficient powerplants that can be built without a steep run-up in the cost to consumers. The problem is the market for EVs and plug-in hybrids hasn't expanded as swiftly as some had anticipated. Major challenges remain: The vehicles tend to be more expensive than those powered by internal-combustion engines, battery range is limited and charging stations are lacking. Last year, sales of the plug-in hybrid Chevrolet Volt and Nissan Leaf EV -- electric-drive cars launched by major automakers in December 2010 -- accounted for only about 0.1 percent of the U.S. light-vehicle market. Many EVs and plug-in hybrids are poised to go on sale in the next two years, and the segment's sales are expected to grow. In March, the industry sold 4,148 EVs and plug-in hybrids, their best-ever sales month. But automakers are carefully targeting their new EVs and plug-in hybrids -- and are keeping their sales projections modest. Ford Motor Co., for instance, is marketing its new Focus Electric mainly to EV enthusiasts. Ford is launching the car this spring in New York, New Jersey and California and plans to sell it nationwide by year end. Ford has not given a sales estimate. Toyota Motor Corp., which this spring launched the Prius plug-in hybrid, expects to sell only 13,000 to 15,000 of the cars a year. A Toyota RAV4 EV coming out this summer will be sold only in California, with annual sales expected at about 800. "Toyota is being realistic about it," spokesman John Hanson said. "We're taking a very measured approach and we're going to see what the market wants." Even so, the Obama administration continues to make its push. In March, the White House unveiled a plan to coax more buyers into alternative-fuel vehicles, including a pitch for more funding for electric-drive and battery technologies, as well as an increase in the federal tax credit for some of the vehicles to $10,000, from $7,500. The administration also wants to make the tax credit available for a broader range of fuel-saving technologies and applicable at the point of sale, a plan some dealers oppose because they say it would force them to offer the tax credit when they sell qualifying vehicles and wait for reimbursement from the government. Obama's efforts also have run into resistance in this election year with Congress under pressure to cut federal spending and Republicans taking aim at green-energy funding. Many auto industry experts are skeptical the administration can hit its 2015 target for EVs and plug-in hybrids. "It would take a lot of work to achieve that goal," said Kevin Riddell, an auto analyst with research company LMC Automotive. "You're going to need a major breakthrough -- a vehicle that can do more than 100 miles in range." His company predicts that annual sales of EVs and plug-in hybrids could hit 230,000 to 250,000 by 2015 and that by 2017 the nation should have 1 million of the vehicles on the road. In the meantime, auto companies and their buyers continue to gravitate to less pricey and more conventional technologies. Manufacturers are trying to eke out better near-term fuel economy from gasoline-powered vehicles, using lighter materials, turbocharged engines and direct injection. Michael Martin, owner of Dudley Martin Chevrolet in Manassas, Va., knows this all too well. His store sold 14 Volts last year, but lately with gasoline prices stabilizing and GM's rollout of the Volt nationwide, interest is waning. So far this year, the dealership has sold seven Volts. The Volt's sticker price is $39,995, including shipping. The $7,500 federal tax credit lowers the price, Martin said, but cost is still a major hurdle for buyers. Most end up leasing the Volt rather than buying it because they believe the price eventually will come down, he said. Other buyers opt for fuel-efficient cars such as the Chevrolet Cruze or Sonic, which cost far less, Martin said. The Cruze Eco, for instance, starts at $20,120, including shipping, and gets an EPA-estimated 28 mpg city/42 highway with a manual. "We're still seeing a strong demand for small cars," he said. "They're looking at the Volt, but they're going to a gas-powered vehicle."